Metro Vancouver’s homeless report: where to from here? With a growing number of homeless camps (now estimated at 70) dug into Metro Vancouver communities, conversation on the issue has veered into a world of personal attacks and draconian proposals. One sample “solution,” endemic in community news chat threads, would re-establish the vast 1905-era asylum on its hillside in Coquitlam and lock homeless people inside. This is a waste of time, of course. There’s no cheap or easy route to rolling back the homelessness problem. In fact, a new report from the Metro Vancouver regional authority is daunting in describing the actions that would be required even to hold the status quo. Media coverage this past week focused on the discouraging statistics: an estimated 4,000 people living on the street or in shelters, 60,000 at risk of becoming homeless. Maple Ridge Mayor Nicole Read, co-sponsor of the report (along with Vancouver’s Mayor Gregor Robertson), referred in the media release to “a complete system-wide failure in the social services network”, a challenge that requires provincial coordination rather than a patchwork of local responses. This reference to the Province and its responsibilities triggered a round of political bickering, which, again, is a waste of time. The best place to start in addressing homelessness is with prevention, “through reducing the risks, early intervention, or treating an underlying condition.” This simple formula, however, points us towards a broad restructuring and strengthening of British Columbia’s social safety net. The development and implementation of comprehensive federal and provincial poverty reduction strategies, with alignment between both. The improvement and expansion of home care for chronic health issues, mental illness and addictions. The establishment of transitional supported-living programs for youth aging out of foster care / child welfare system. The expansion of programs to meet the need for holistic and culturally safe support services to assist Aboriginal individuals and families in securing and maintaining housing. The establishment of discharge planning programs to ensure subsidized or market housing on release from incarceration. An increase in the supply of rental housing that is affordable to households with incomes below $30,000 per year. So what happens to a report like this? In most cases, they fade into the cyberwilderness. On the day after their release, like foster children turning 19, they are turned out onto the street. Within the pages of Addressing Homelessness in Metro Vancouver, nobody takes responsibility for authorship, and there’s only fleeting reference to the process behind its release. Best practices were assessed, it seems. Data was gathered. Looking at the bigger picture, the entire Metro Vancouver authority flies mostly under the radar. It does important things, like managing the regional sewer and water mains. It regulates air quality. It provides labour relations services for 21 member municipalities. A collection of bits assembled over time, quietly overseen by a panel of very part-time municipal politicians. The regional district (or county) collected $670 million in 2016 to fund its work. Who knew? When Metro Vancouver conducts a review of its parks system, 50 per cent bigger in area than the old City of Toronto, nobody pays attention. When it issues a forecast on what climate change could mean for southwest B.C., we don’t really worry. The Province has a responsibility to lead on this issue, and develop a multi-pronged strategy that would take in all urban municipalities. However, taking action on homelessness is a project of limited political appeal to any governing party, and the Province needs to be pushed. And the Metro authority is not designed to push the Province, at least through any overt campaign. The responsibility for advocacy lies, unfortunately, with a regional level of civil society that does not currently exist. In the flowering of 1990s bureaucratic urbanism that produced a Metro Vancouver regional growth plan and transportation plan, there was no corresponding grass-roots eruption of interest in the issues that leak across municipal boundaries. For any organization that tries to work regionally, the going is hard and the constituency small. 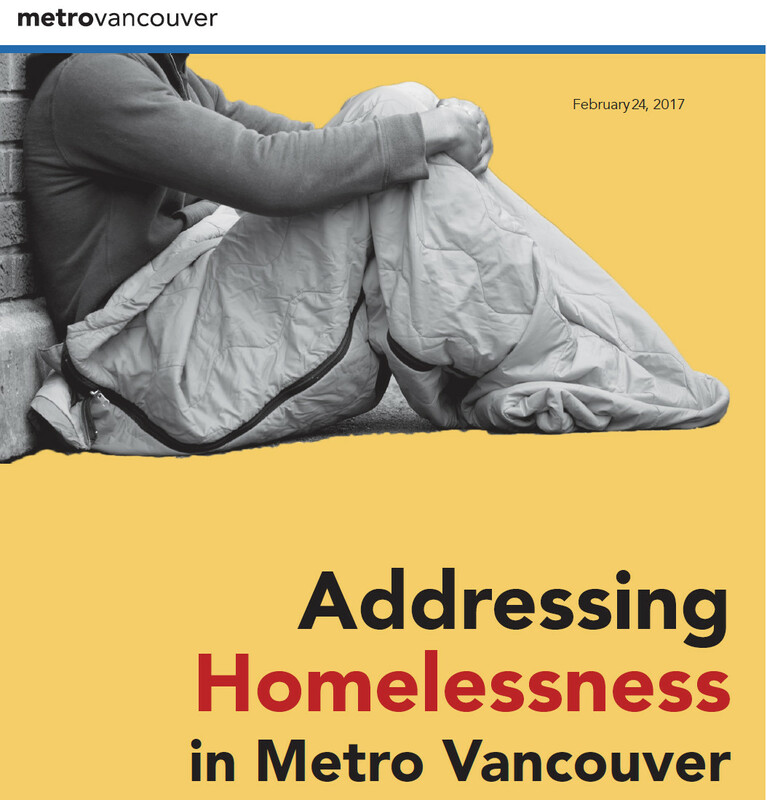 The “Stop Homelessness” coalition for Metro Vancouver maintains an optimistic presence online, but its most recent spasm of activity appears to date from the spring of 2015, and there is nobody in building to mark the appearance of this new report. The homeless problem, meanwhile, is not going away. At Fraseropolis.com, we’ve had people camped on our home-office property or in shifting nearby locations since we moved here in 2001. The statistics suggest this experience is becoming more common. General awareness of homelessness and its costs will continue to increase, for good or ill.